Today I decided to record the entire stitching process. For stitching purpose I used a 4 inch hoop made of beech tree. I used wool that I felted with the needle. I used different varieties of embroidery thread (DMC, Anchor, Ariadna). The main element is polymer clay mask that I sculpted myself and painted with special powders. Later I baked the clay piece and when it was hardened I stitched it on a hoop. For felting wool I used three felting needles combined together. The mask is central point of the composition. The main element as well as the background are grey. Contrasting elements are brought into by turquise, blue, navy blue threads. 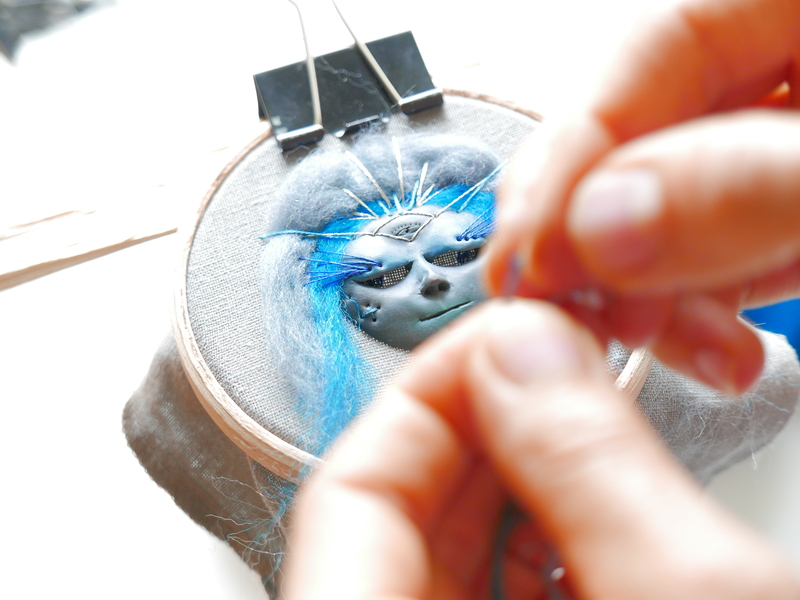 Special charm adds silver DMC thread – I stitched some kind of crown using silver. The entire stop motion video took about 200 photos. After the shooting I added some extra details. It was my first ever stop motion of the stitching process. I was uncomfortable, stitching while standing, adjusting setting of the camera, making mistakes, being afraid that it would go wry. But overall experience is positive. I did it and the movie is amazing. I hope to create more in the future. I wish I had a lifetime to stitch beauty on hoops. The mask is going to be a part of my shop update next month. If you like these masks you can read more in the blog post on this series: Bored, Sad and Nerve – hand embroidered masks. ← The seeds of new art adventures – you can write the book too!